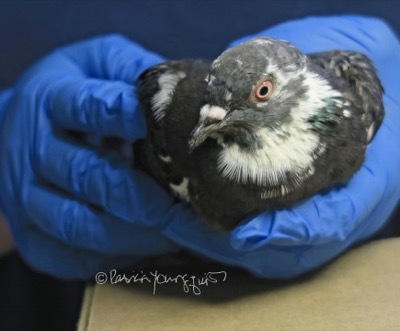 The pigeon pictured at the top of this blog entry is being held by a bird rehabber at The Wild Bird Fund (WBF) in NYC. She was evaluating the pigeons physical state. I had brought the pigeon The WBF (yesterday) after I noticed that he had an accident in my urban rooftop garden. Apparently the pigeon got his foot caught while trying to open one of the canisters that is in my garden. It is what I use to store the black-oil sunflower seeds that I put into one of my bird feeders. I had not realized it until I got close enough to him to see what was happening. 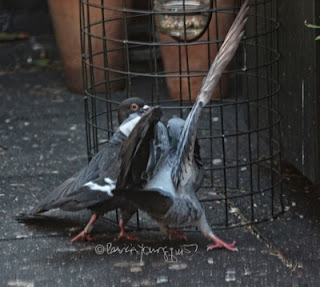 At first I thought he was stuck between the stand — that supports a potted myrtle — and the canister, so I moved the stand to free up space for him, but other than flapping his wings, he did not attempt to fly away, then I realized that his foot was caught under the canisters handle. 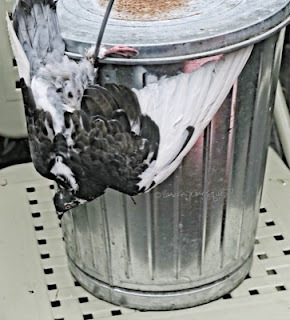 I placed the canister on my bouncer in the hopes that I'd be able to help the pigeon in getting his foot out from under the container's handle. My efforts were to no avail, his foot was stuck firmly under the handle, and the inside of this wings were full of blood. He continued to try and break free, but his efforts to do so were futile. A workman happened to be at my home and he was able to free the pigeon, who immediately "crawled" behind a container in my garden. I moved the container and tried to give him some water as I believe he was dehydrated. 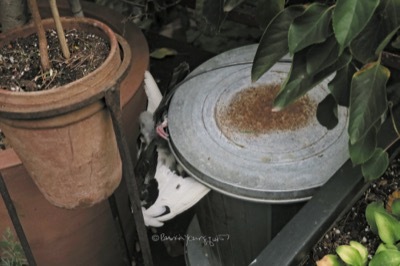 I am not sure how long his foot had been stuck under the handle of the container, but I did recall seeing a lot of wing flapping in my garden earlier in the day. 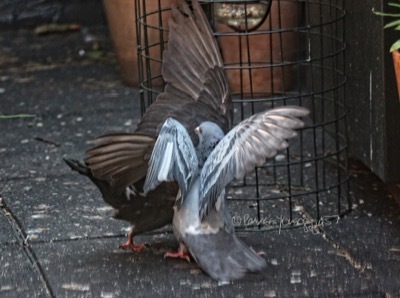 From my window I could see a pigeon flapping his wings wildly, but that is not unusual in my garden. A couple of years ago, an adult pigeon was flapping her wings wildly while teaching her son tricks of their trade. 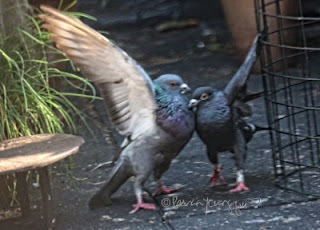 I know when adult birds are interacting with their young ones, its best to give them privacy, therefore, when I saw the flapping wings of the pigeon, who unbeknownst to me was stuck, I didn't think it was unusual and gave him his privacy in the event he was helping his offspring. It was when I decided to move close to him that I saw the trouble he was in. I assumed he'd tried to open the lid as he may have observed me opening it in the past. Whenever I think of birds actually opening containers I am reminded of the day my father died, which was November 30, 1995, and the day was very cold. Neighbors of my father's wife (JY) had brought food to their house and she became disgusted and stated, "What am I going to do with all this Goddamn food?" JY's daughter (JW) suggested that she put the food on her porch, to which JY replied. "The Goddamn birds will open everything." JW shrugged off her mother's remarks saying, "I don't think they can open the wine, ma." Yesterday as I saw the bird's foot stuck under the handle, I thought that perhaps JY knew something about birds and their ability to open sealed items (but probably no wine). 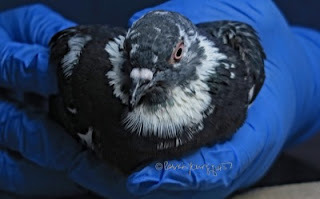 In any event, my past experience in assisting with the rescue of a bird I'd named Thursday (also a pigeon), and Super (a Northern Flicker) meant I knew that I had to wrap this injured pigeon in a towel then place him in a box, and take him to The WBF. Since I have no spare boxes in my apartment, I had to empty the contents of one that was filled with papers, in order to transport this sweet creature to receive medical attention. However, my" pigeon's attempt to free himself had caused him severe injuries. The bird rehabber informed me that the break was too far up to amputate his foot and claimed the injury was so old that brownish coloring was appearing. She let me pet him a few times before taking him away to be euthanized. I am very saddened by the bird's plight, and I hope that he felt comforted by the efforts of the workman, the bird rehabber and me.